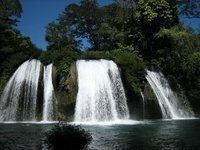 Located in the far southeast corner of Mexico, Chiapas is an amazing off the beaten track place. Being on the border of Guatemala this area of Mexico has a very large Mayan population, which is more then quarter of the total population of just over 4 million people. Most of the state is very poor and rural making life difficult for the natives. People have lived in the Chiapas area since pre-history. The oldest Maya Long count date discovered, dated to 36 BC, was found in Chiapas. Other large Mayan cities and towns from many different periods are located in Chiapas. The Spanish conquered the area in the early 16th century. Originally part of Guatemala parts of Chiapas were annexed by Mexico in 1842, because of the disintegration of the Central American Federation, and in the 1880s. Although during this period there were several native rebellions that were suppressed by the Mexican army. In the 1990s the locals in the province got angry again, because of the poverty and discrimination, and formed the Zapatista Army of National Liberation (EZLN). There were several battles between the EZLN and the Mexican army during the mid to late 90s but the area has settled down again making it safe for travel. If wanting to see remote Mayan ruins and unique rural communities, Chiapas is a great place to visit. The Chiapas is divided into five distinct geographic zones. The five different areas are rain forest, highlands, central valley, Sierra Madre De Chiapas and the Soconusco. The rain forests in Chiapas are being deforested due to population pressures from highlanders forced into the rain forest and people feeling the civil war in Guatemala. Most of the rain forest is located along the Guatemala border. The Central Highlands have been a major population center in Chiapas since the Conquest. Spanish conquistadors settled in the area and used the indigenous people as indentured servants. Since the Second World War the highlands have been a center for the oil industry in Mexico. The Central Valley is the area along the Rio Grande de Chiapas that flows from southwest to northeast threw the Sierra Madre De Chiapas. There are several hydroelectric plants along the river. The Sierra Madre De Chiapas run northwest to the southeast along the Pacific Ocean. These mountains are volcanic making for high peaks, occasional eruptions, earthquakes and good soil. The mountains block the rain making the costal region known as a Soconusco. The Soconusco lies in the southernmost corner of the state. This area has a very rich agricultural industry and creates some great coffee. Palenque is a small town that is home to some stunning ruins and a centre for Mexican hippy culture just outside of town. San Cristobal de las Casas is an amazing city with a rich indigenous culture. The Palenque Ruins are the main reason why people come to Palenque. Although not as massive as Tikal, its rival to the south, Palenque is home to some stunning structures and well preserved wall art that few other major Mayan sites can claim to have. Remember that during the busy season Palenque can have over a 1,000 visitors a day, so it can get awfully crowded. Although it is possible to take tours to the ruins most of the time the tours do not stay long enough. This is practically true for day tours from San Cristobal de las Casas, which only give 2 hours at the ruins. In order to really experience the awe, wonder and every corner of this ancient city it takes 4 to 6 hours. It is best to bring good walking shoes and plenty of water. As a warning the mushrooms sold by locals near the entrnace in the spring time are of the magic variety. Bonampak is a small Mayan ruin located in the Lacandon rain forest with some of the best Mayan murals in the world. Yaxchilan located on the river between Chiapas and Guatemala this ruin can only be reached by boat and home to countless howler monkey's that let their present be known. Lacandon Rain Forest has amazing biodiversity and a great place to see some unexcavated ruins. Agua Azul is a stunning waterfall. Dia de la Candelaria. Candlemas is held February 2nd and commemorates Jesus being introduced into the temple 40 days after his birth. This nationwide celebration sees many different ways of celebrating and many towns in Chiapas State hold processions, bullfights and dances. Of course, plenty of delicious, traditional foods are served during Dia de la Candelaria as well. Carnaval is held in late February or early March throughout Chiapas State and all of Mexico. This big party is meant to celebrate the 40 day penance of Lent. Carnaval always takes place during the week or so prior to Ash Wednesday, 46 days before Easter Sunday. Mexicans celebrate this holiday with fireworks, food, dancing, parades, dancing and drinking. Semana Santa, or Holy Week, is a huge celebration which starts on Palm Sunday. This is a very popular time for Mexicans to take a short break; as a result, it seems most of the country is on the move, with buses and hotels often booked out. As for the celebration of Semana Santa, expect colorful processions and many masses at churches everywhere. Día de Nuestra Seňora de Guadalupe, or Day of our Lady of Guadalupe, is held December 12th. There is a week-long build up to this religious celebration in honour of the Virgin who appeared to the indigenous Juan Diego in the year 1531. Since then, the Lady of Guadalupe has been Mexico's religious patron and her veneration is very significant. It is traditional for young boys to be dressed as a Juan Diego and for young girls to be dressed in indigenous garb and brought to a special mass, held at many churches throughout the country. In general, Chiapas has a humid, tropical climate. In the north, in the area bordering Tabasco, near Teapa, rainfall can average more than 3,000 mm per year. Angel Albino Corzo International Airport (TGZ) is a new international airport located near the city of Tuxtla Gutierrez. Currently this airport only has domestic flights manly to Mexico City and a few flights to Oaxaca, Cancun, Guadalajara, Mérida and Puebla. It is possible to drive a car to Chiapas but remember that all the roads into and to Chiapas are town lane highways. Long distance buses connect the major cities and towns of Chiapas with all of Mexico and the major cities in Guatemala. During the busy season it best to book your tickets a couple of days in advance, since some towns might only have one or two buses a day. For an overview of schedules and connections, check thebusschedule.com. Also check out rome2rio.com. Along the Guatemala border there are some ferries and shorter boat rides to certain villages. Some of them are scheduled while others operate when someone is around. Some of border crossings don't have offices right them making travellers need to go to nearby towns a register with customs and immigrations offices there. Although it is possible to rent a car and drive around Chiapas the roads in the mountains are intense and can be very dangerous. Remember some areas, especially near the border can be dangerous because of human and drug trafficking. It is best to avoid the highways after dark. Most of the towns and cities in Chiapas are connected by a great network of buses. Some of the smaller towns can only be connected by collectivos, which can be a bit uncomfortable although the rides are short. The roads can be bit rough so if you suffer from road sickness it is best to take some drugs and sit up towards the front. For an overview of schedules and connections, check thebusschedule.com. Also check out rome2rio.com. Mollete is an open faced sandwich consisting of a bolillo roll smothered in refried beans and melted cheese. Carnitas are slow braised meats usually bought by weight. These often come with tortillas to wrap the meat in. Any meats cooked in this fashion are always tender and very rich in flavor. Cabuche is the flower from the biznaga cactus. this edible flower is a delicacy in San Luis Potosi state. There are many dishes this flower can go into and many ways to prepare it on it's own. Chiles en Nogada - this dish is meant to represent the Mexican flag's 3 colors; red, white and green. The red portion of this dish is a garnish of pomegranate seeds, the white from a cream sauce and the green from poblano chili pepper. Huitlacoche is a fungus that grows on organic corn ears due to the lack of anti fungal chemicals introduced to the crop. When cooked and added to certain dishes huitlacoche is very earthy in flavor. Pozole - Choose either red or green pozole. This corn and chile based soup is very tasty and is served at many comedors and loncherias in marketplaces throughout Mexico. Rosti-Pollo - Roast chicken is a hugely popular meal in Mexico and represents an astounding value for travelers on a budget. Order a whole, or half chicken. Each order comes with french fries, unlimited tortillas and salsa. Birria Stew - Birria is typically goat meat but many establishments prepare it with beef. The broth is a tomato and chili based one although it is not too spicy. Fresh diced onions and cilantro always accompany birria stew as a garnish. Of course, unlimited corn tortillas are served with each bowl. Montejo, Leon, Victoria, Superior, Carta Blanca and Estrella are national brands that can be difficult to find at times depending on where you are in Mexico. Lately, both Tecate and Indio brands have become the most widely distributed beers next to Corona. Many of the beers mentioned are brewed by Mexico's brewery powerhouses - Modelo and Cuauhtemoc. One of the traditions in Mexico is to add lime to beer, adding a pleasant acidity. Another popular way to drink beer in Mexico is to mix it with lime, tomato juice, spices and assorted chili-based sauces. This drink is known as a Michelada and is very popular in hotter climates throughout Mexico and actually makes for a very refreshing concoction. Oro, or gold is possibly the poorest quality of the lot. That gold color this variety is known for is artificial and this tequila really burns the throat. It is best used in cocktails and margaritas. Plata is also known as Blanco and represents the next lowest quality of the 5 varieties but tastes better than the Oro variety. This is unaged and the flavor is much less complex, making it suitable as a mixer rather than a shot for sipping. Resapado means rested and this variety is aged for up to 9 months. Flavor profiles become more complex and respado makes for a good introductory sipping variety. Expect a clean, sharp taste with a subtle peppery finish. Aňejo. This aged variety, conditioned in oak barrels for up to 1 year, is very smooth and sweet. Many people enjoy this variety as an aperitif, or even an after dinner drink. Certain brands of aňejo represent a very good value, especially considering the amount of nuanced flavors created by each distilleries' aging techniques. Extra Aňejo, or vintage, is a relatively new variety. This is aged for 3 years, often using other types of barrels aside from the traditional oak ones. This is best sipped neat. Extra Aňejo has boosted the craft tequila market in Mexico. Minero is distilled in clay pots and is a very high quality variety. Subtly smoky in flavor and very smooth. Arroqueňo tends to be a subtly sweet-tasting Mezcal. Many find this to be the most pleasant variety. The flavor begins a bit bitter but quickly finishes sweet and warm. Joven means young, and this variety is simply unaged and therefore a little bit rough. Tobalá is named for an actual variety of agave plant, grown in mountainous regions. Pulque has been enjoyed since well before the Spanish conquest of Mexico but has enjoyed a resurgence in the last decade, especially among the hip crowd. Pulque is simply the fermented sap of the maguey plant. The end result is a very thick, cloudy drink with a slightly acidic taste. This viscous liquid is often given artificial fruit flavoring to improve it's overall uninspiring taste, however many pulque drinkers are purists when it comes to quaffing this strange alcoholic beverage. In Mexico, pulquerias - bars exclusively serving pulque - offer a real authentic drinking experience and many feature roving musicians ready to play a tune for the merry patrons. Pulque has an alcoholic content between 4% and 6%. In the major tourist areas there is a good mix of hostels, hotels and high end resorts. While in the smaller or more industrial cities there tends to be high end hotels for business travellers and lower end hotels for people looking for a quick place to sleep. This is version 31. Last edited at 19:46 on Apr 23, 19 by road to roam. 17 articles link to this page.